You may think that muffins are nothing more than cupcakes masquerading under the guise of breakfast foods, but strictly speaking that isn't entirely true. There are five categories of cakes - creamed fat, liquid fat, fatless or egg-foam, yeasted, and hybrid cakes. Each category of cake is defined by specific ingredients and leavening agents - and this is where you'll find muffins differ from the average cupcake. Your typical cupcake is made with the creaming method - butter or shortening are combined with sugar and beat to incorporate air, creating a light, fluffy texture. Muffins, on the other hand, are typically made with a liquid fat such as oil (or a semi-liquid fat like sour cream); no air is whipped into the batter during mixing, so the end product is denser and more moist. Not only are oil based cakes easier to mix, they also last longer than their creamed counterparts! 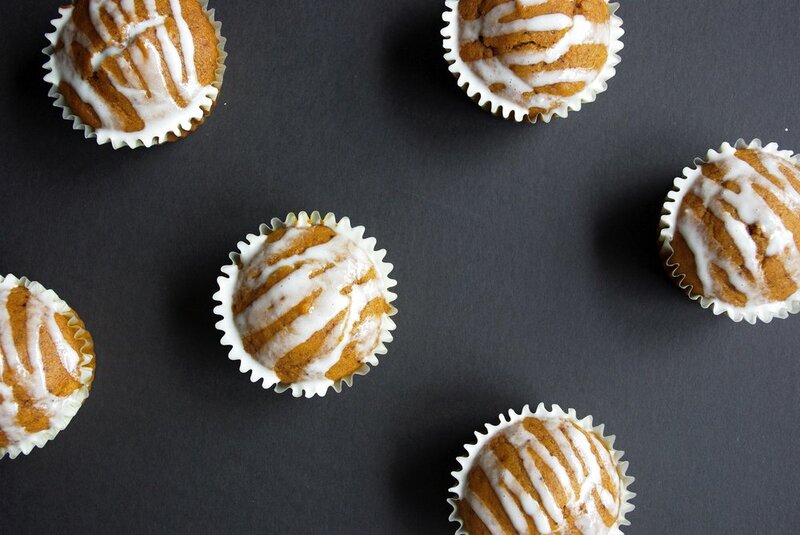 As we're all aware, fall is in full swing, and that means one thing: 'tis the season of all things pumpkin. Now, if I'm being totally honest, I've never been a huge fan of pumpkin. But it's not the flavour that bothers me - it's the overwhelming sweetness that seems to pervade most pumpkin products, completely killing any semblance of a flavour profile. I like to taste the ingredients in my bakes. 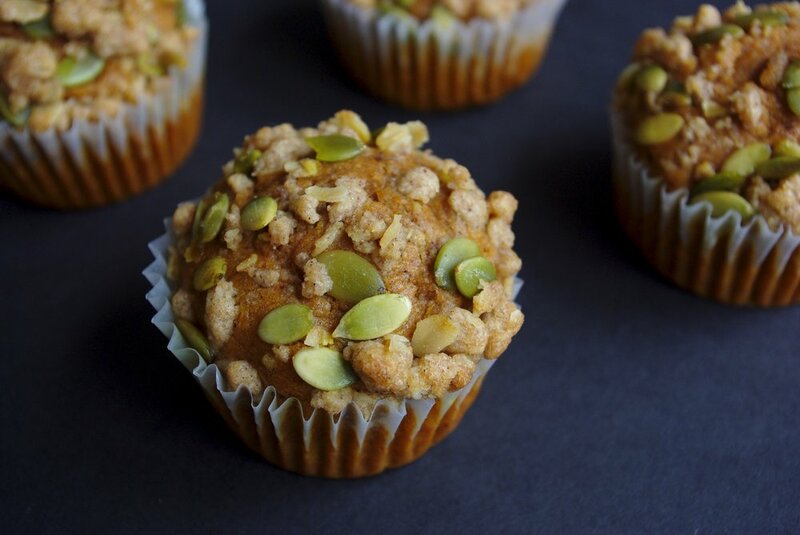 And I definitely don't want my breakfast foods leaving me with a toothache, which is why this muffin recipe is a fall favourite. These muffins hit all the right marks for me - easy to mix, not too sweet, and infinitely variable. I've brought this recipe to several bakeries I worked in, and during my time as a personal chef I made them weekly for multiple families. Every time I make them, I find a new variation to try, but they don't need all the bells and whistles to shine - they're perfectly delicious all on their own. * The imperial measurements here look a bit odd because this recipe was reverse engineered from grams. If your liquid measuring cup has marks for milliliters (which it probably does) it will definitely be easier for you to measure the liquids that way. Milliliters and grams are interchangeable, so 80 g = 80 ml. For more information on these weird measurements, check out our "about" section. *As I said in the intro, this recipe can be changed about a million different ways. For an extra kick of sweetness, top these muffins with a glaze, or add some white chocolate chips. Want an extra crunch? Pecans and walnuts are both great additions to this flavour profile, but any nut or seed will work. Is there leftover streusel in your freezer from making Peach Blackberry Crisp in the summer? Sprinkle that on top before baking! I combined my streusel with pepitas for some extra colour and crunch. 2. COMBINE all your dry ingredients - except for the brown sugar - in a large bowl. Using a fork, stir to combine, then set aside. 3. 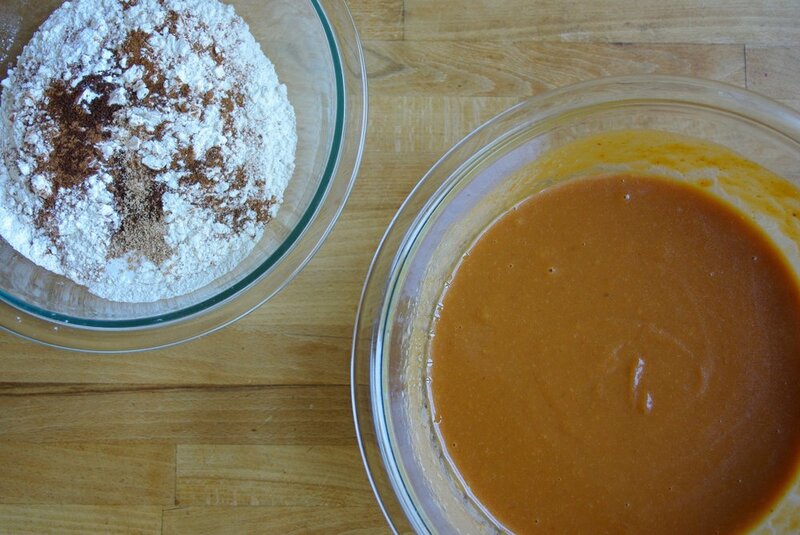 WHISK together all your wet ingredients, plus the brown sugar. If you're measuring your ingredients out ahead of time, leave the eggs separate and add them only when you're ready to begin mixing. Letting the eggs sit with the sugar untouched will cause the eggs to "burn." 4. CHOP or prepare any add-ins that you may be using and set aside. Aim for chopping your ingredients slightly smaller than a chocolate chip. If you're using a "wet" ingredient (i.e. fresh fruit) don't forget to coat it in a little flour so it won't sink to the bottom of your muffins. 5. GREASE a muffin tin well, or line with baking cups. Depending on how large your cupcake tray is this recipe will yield between 12-16 muffins. 6. POUR your wet ingredients into the bowl of dry ingredients. 7. WHISK your wet and dry ingredients together, working until they're just combined. 8. FOLD in any add-ins you may be using. 9. SCOOP your batter into the prepared muffin tin(s), filling about 3/4 of the baking cups. 10. SPRINKLE with streusel or chopped nuts, if you're using them. 11. BAKE the muffins for 9 minutes, turn, and bake for 9 minutes more. After 18 minutes, insert a toothpick or skewer to check if they're done. A couple crumbs clinging to your toothpick is fine, but it shouldn't come out wet. If necessary, bake for a few minutes more, checking frequently. You can also check if your muffins are done by pressing gently on their tops - if they spring back right away, they're ready. If the indent stays, they need a few more minutes. 12. TIP your muffins out of the muffin tin and on to a wire rack to cool. If you're planning to glaze your muffins you should wait until they're completely cool. You could also brush your muffins with a syrup of your choice, but this should be done when the muffins are still slightly warm. 11. MIX your glaze ingredients, if using. Add a few tablespoons of powdered sugar to a bowl, along with any spices or flavourings you may be using, and add your milk or water a teaspoon at a time. You want a smooth mixture, but it shouldn't be too watery. If you've added too much water, you can always add some more sugar to achieve your desired consistency. 12. SPRINKLE the glaze over your muffins, or dip their tops directly into the glaze. Wait about 5-10 minutes, then dip a second time. 13. STORE your muffins in an air-tight container for up to a week. These muffins are particularly lovely when re-heated in a toaster oven for breakfast, but they're just as delicious at room temperature too.